mixing and editing the results and I’ll post some of it as soon as it’s ready. I also did some playing and recording in Mexico City with my friend drummer/percussionist Javier Sosa. He played drum set and various percussion instruments and I played guitar and dulcimer. I’ll be adding some bass here at home and then mixing the results. So far it sounds great – I hope I don’t mess it up with the bass parts! Once again, I’ll post the results when they’re ready. After returning home I did another session with jazz and R&B vocalist Jazmin Skye. We have been playing duets of voice and guitar and we recorded four tunes to function as a demo. As you might guess, my hands have been full with mixing and editing! Downers Grove on the 6th of August and it was really great. such a way that you really feel a connection to the listeners. I hope everyone had as good a time as I did! I’ll also played a CD release/benefit show in Ozark, Missouri on Sunday, August 22nd at the Ozark Presbyterian Church in Ozark, Missouri. 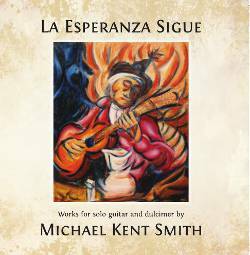 On August 6th my new CD titled “La Esperanza Sigue” was released. hope for the children of the world and titled it “La Esperanza Sigue” which translates from the Spanish as “The Hope Continues”. I’m really pleased with how it turned out and I hope that it inspires something of hope in you. Before I get to the new recordings, I have an upcoming show to plug. I’ll be at Adelle’s (1060 College Ave. in Wheaton) on Thursday, April 30th. I’ll be playing in a duo format with bassist Patrick Williams and we play from 7:00 to 10:00 pm. We’ll play a lot of my original material with some jazz standards blended in to fit with the restaurant’s “jazz night” theme. The restaurant has very good food – I know because it’s one of the rare places that feeds the musicians – so come and eat and listen. There is also a bar area right in front of the musicians so if you just want to come and just have a drink you’ll have a perfect seat for the music. I’ve been recording an awful lot lately. I started with three sessions in Mexico, the most extensive being with Armando López Valdivia, the early music specialist from Guanajuato that I play with frequently. On the trip to Mexico I brought my portable recording rig which consists of a digidesign Mbox, a laptop and a pair of mics. While I was in Mexico City I also recorded some solos by Eduardo Garavito, an excellent African percussionist who also was on the Africa tour. I recorded him solo and I will edit his tracks to become accompaniments for a series of guitar/percussion duets that I will compose. Unfortunately, I haven’t had time to write the guitar parts yet since I’ve been so busy with all these other recording projects. By the next Newsletter, I’ll have the guitar music composed. I also went into the studio with Eduardo and three other musicians to record a track for his upcoming CD. After sorting out some technical difficulties the session went well and I look forward to hearing the end result. Now to the new toy. I asked Mexican guitar builder Salvador Castillo from Paracho, Michoacan to make me a custom classical guitar. I had gotten to know him on my previous visits to Paracho and really liked his approach to building guitars. He built me a beautiful instrument of Brazilian Rosewood with a European Spruce top. I played it on the recordings with Armando a mere two days after buying it but I had very little time to play it besides that. I was looking forward to getting it home and really exploring its possibilities. However, when I arrived at O’hare airport at the end of the trip there was no guitar at baggage claim. They had made me check the instrument instead of letting me carry it on board, which they sometimes do. When I finally found a representative to help me (this was at 2:30 am) she asked me for my claim ticket which I realized I had left it on the plane. She called the crew on the plane and they told her that they had already cleaned the plane and thrown everything away. I was told that without the ticket I would have no claim against them if the instrument was lost. I thought that it was gone for sure. She gave me a phone number to call the next day and I took a cab home in a rather dejected state. I called the next day and, lo and behold, they had found the guitar! They offered to bring it to my house but I said that I’d be right there to pick it up. When I arrived at the airport they handed me the instrument and I opened the case (it was in a hardshell case with a padded case around that) to check it out. At first it looked O.K. but then I saw that the heel block had cracked all the way through. They must have dropped it from a substantial height to make it break like that. I was given a number to call to initiate a claim and I’m still fighting with the airline to see what they will do about it. I’ll keep the airline anonymous for now but if they don’t come through, believe me, I’ll make sure everyone knows which airline it was! The next day I brought the guitar to luthier R.E. Brune in Evanston and he did a fantastic job of repairing the damage and I now have the guitar back in my posession and I’m enjoying it immensely. I just landed a last minute gig. This Friday the 27th I’ll be playing solo at The River’s Edge Café in Aurora (http://theriversedgecafe.com/) . It’s located at 18 W. Downer Place, Aurora IL 60506. I play a set 7:30 pm and singer Harry Brown will do a set following mine. It’s late notice, but if you can make it, great! Also on the horizon: the Pong Unit will be making an appearance at the Uptown Poetry Slam at the Green Mill (http://www.greenmilljazz.com) on Sunday, April 5th at 7:00 pm. with Carter Luke on piano, Steve Hashimoto on bass, Heath Chappell on drums and me on guitar. It’s always a good time and the band is really getting to sound good! 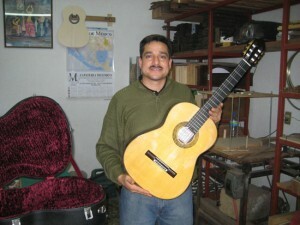 I’m leaving this weekend for Mexico to pick up a new custom classical guitar built for me by Salvador Castillo. He is one of the excellent young guitar builders in the town of Paracho where I visited last year. I have played his guitars and liked them all very much. Over two thirds of the town’s population earn they livelihood from the guitar building trade and over the last two decades a tradition of building very fine professional instruments has been developing. I have seen photos of the new guitar but I can’t wait to get my fingers on it! After Paracho I will be heading to Guanajuato to record with Armando López Valdivia. Armando has a collection of over 200 instruments. Most of them are replicas of instruments from the Middle Ages and Renaissance but several are from Africa and Asia as well. The outcome of the sessions may make for a CD or it may just be a tool for getting concerts but either way I’m sure it will be great fun to play and record. On the Mexico trip I’ll also be visiting my friends in Mexico City and doing some recording for a project of percussionist Eduardo Garavito as well as possibly doing some recording with drummer Javier Sosa as well. After I return I will post some audio, photos and hopefully video of the new guitar and the recording sessions. I am selling a 1973 Fender Stratocaster with natural finish, ash body and maple fretboard. I’m asking $2200 for it. If you’re interested, contact me and I can send photos and give you more information on it. Mexico on August 7th turned out to be one of the best concerts I’ve ever given. Valdivia joined me on stage again. He played with me there 2 years ago and it was a fantastic show. 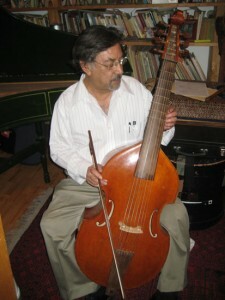 Armando is an early music specialist and has a collection of nearly 200 instruments – and he plays them all! On the strength of that concert I was offered another at the Museo Dieguino also in Guanajuato. The environment for that concert wasn’t as ideal as the Iconográfico, but the seats were filled with attentive listeners. mixed down. I then went to Paracho, a small town in the mountains of the state of Michoacan to purchase some instruments. I’m heading down to Guanajuato, Mexico for a concert on August 7th at 7:00 pm in the ‘Museo Iconografico de Don Quixote’. It’s a great space to play in with marvelous acoustics. The museum is an old converted hacienda and they put a glass roof over the courtyard, which is where the concerts take place. I hope to have a guest appearance by my friend Armando Lopez Valdivia who plays an incredible variety of early music instruments. When I played at the museum 2 years ago he joined me for the second half of the concert playing replicas of several ancient instruments in my pieces. We also performed a couple of Medieval tunes that were really fun to play with such a master of early music. The art department at the museum has made a great poster for the show. 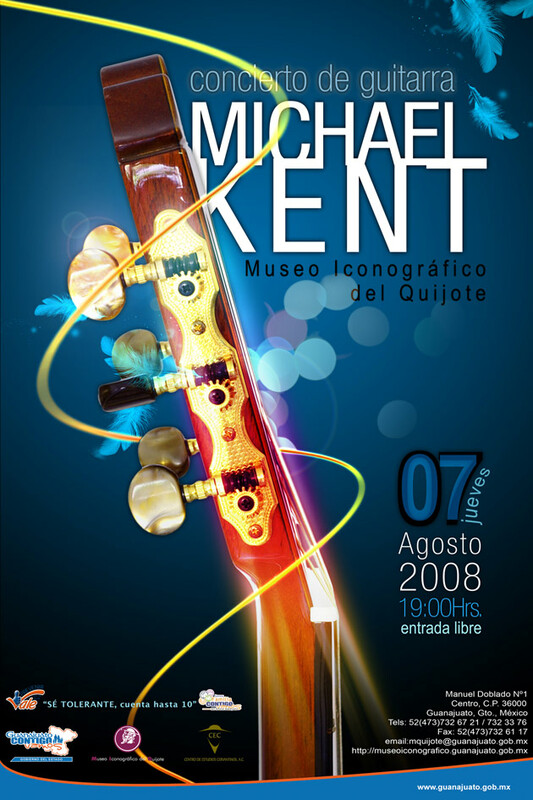 In Spanish speaking countries they always drop the last of 3 names so in Latin America I’m Michael Kent… no Smith. Click here to see a jpeg of the poster – I hope they saved a copy for me! After the show in Guanajuato I will be heading to the town of Paracho in Michoacan where 3/4 of the town earns their living in the guitar building/selling trade. It’s a small village in the mountains and is quite traditional but there are a handful of excellent builders and I want to try their instruments. I also have some orders to scope out a mandolin for my brother and a guitarrón (the big mariachi bass) for my bassist friend Jack McAuliffe. Hopefully I’ll find good instruments at excellent prices for them. Then it’s on to Xalapa (or Jalapa), the home of the jalapeño pepper in the state of Vera Cruz. It’s also home to the best symphony in Mexico as well as a large music school that creates quite a local music/art scene from what I hear. It’s also supposed to be a very beautiful city so I decided this is one place better go and check out. I was remiss in not warning you in advance of the reunion of the classic Pong Unit (the mach 2 version of the band with Steve Hashimoto – bass, Carter Luke – keyboards, Heath Chappell – drums and me on guitar) at the Green Mill Poetry Slam last Sunday. That version of the band hadn’t played together in 10 years and it was like we had hardly skipped a beat. There were a couple of dicey moments in the more complex arrangements but the feel of the band hadn’t lost anything. Next time we play the Mill, I promise I’ll announce it in advance. It’s worth checking out. I was invited to tour as the guitarist in the band of Koulsy Lamko, an African vocalist currently residing in Mexico City. The tour visited several cities in Mexico, France, Italy, Mali and Burkina Faso. The band was part of “The Caravan Tom Sank” which celebrated the life of Thomas Sankara, the former president of Burkina Faso. Although the tour had a number of logistical problems, it was fascinating to see Africa and to get to know the people a little bit. We had a couple of fantastic opportunities to play with griots in Mali. The griots are a caste of musician/poets that are raised to be artists from childhood and keep their people’s cultural story and wisdom in memory through song and spoken word. I have never played with more natural musicians in all my life.